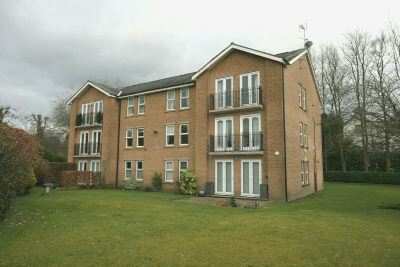 A SPACIOUS TWO DOUBLE BEDROOM TOP FLOOR APARTMENT THAT IS WITHIN WALKING DISTANCE OF ALTRINCHAM AND HALE. Communal Entrance. Living Dining Room with Juliet Balcony. Two Bath/Shower Rooms. Courtyard Parking. Communcal Gardens. UNFURNISHED. Available EARLY FEBRUARY. A heavy timber panelled door provides private entrance to Apartment 11. A fabulously proportioned combined Living and Dining Room with much natural light via two double glazed windows to the side elevation and two sets of double glazed French doors opening onto the Juliet Balcony and enjoying a fabulous aspect across the open space of the Devisdale to the rear. There is a panelled door leading to the Kitchen. Coved ceiling. Two double panelled radiators. TV aerial and telephone points. With two double glazed windows to the front elevation and refitted with a range of modern Maplewood veneer fronted base and eye level units with brushed metal finish handles and laminate work tops over, inset into which is a stainless steel one and a half bowl single drainer sink unit with chrome mixer taps above. Integrated stainless steel appliances include a fan assisted oven and grill, a four ring gas hob above and a canopied extractor fan over. Built in washer dryer with dishwasher with fronts matching those of the cupboards. Recess suitable for tall fridge freezer unit. Glazed fronted glass and china display cabinet with two inset halogen spotlights. Two further halogen spotlights inset into a pelmet over the worktops and concealed lighting beneath the eye level units. Ceramic tiling to the return of all the work surfaces. Built in wine racks. Double panelled radiator. With an opaque double glazed window to the front and fitted with a modern white suite with chrome fittings comprising: Enclosed corner shower cubicle with a Mira thermostatic shower. Wash hand basin with chrome mixer taps set upon a vanity unit with toiletry cupboard below and vanity mirror above with vanity light. Close coupled WC. Ceramic tiling to the full height of the shower cubicle and to the part height of all further walls. Single panelled radiator. Three halogen spotlights inset into the ceiling. Extractor fan. Another excellent Double Bedroom with two double glazed windows enjoying a delightful open aspect across the Devisdale to the rear. There are extensive built in wardrobes with hanging rails and storage cupboards above. Double panelled radiator. Refitted with a modern white suite with chrome and gold coloured fittings, comprising: Panelled bath with twin handgrips. Pedestal wash hand basin with mixer taps and deep toiletry ledge over with a plate glass mirror above. Close coupled WC. Ceramic tiling to the full height of all walls. Single panelled radiator. Extractor fan. The Woodridings is approached through a cobble paved Driveway to a Courtyard area within which there is One Reserved Parking Space. This is directly opposite a Single Garage in a block. Both the garage and the parking space are positioned close to the communal entrance of the apartment. The Woodridings enjoys beautiful communal gardens laid to all sides, which are laid predominantly to lawn with deep mature borders with a wide variety of shrubs, bushes, mature trees and plants. In particular the gardens enjoy a backdrop onto the open space of the Devisdale.